Screenshot of 3AW Melbourne video. 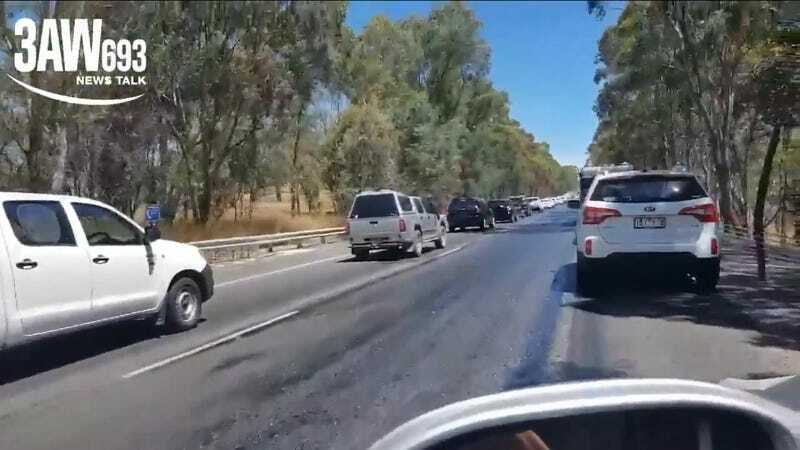 One of Australia’s most major highways, the Hume Freeway linking Melbourne to Sydney, has seen some interesting traffic patterns as of late. It’s all thanks to the tar in the road literally melting under sustained 100-plus degree temperatures of a heat wave. It’s not really that the whole road is melting, just the tar. (That’s the tar in tarmac.) Basically, the tar holds the solids of the road together, it gets hot and gooey, and the once-solid-looking road starts to melt. The area has stayed sweltering hot over the weekend, as evidenced by this kangaroo taking a dip in someone’s backyard pool. I’m going to go back to cuddling my radiator for warmth.